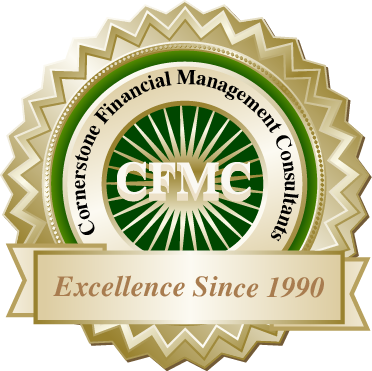 Cornerstone Financial Management Consultants, L.P. (CFMC) is a unit of The Cornerstone Group INTERNATIONAL. Founded in 1990, CFMC is a consulting and investment banking firm with offices in Austin, Houston, Lubbock and Las Vegas specializing in consulting, strategic planning and small business finance primarily for middle market businesses with sales of more than $750,000 or seeking financing in the $1 million to $25 million range. However, given the current market uncertainties, we have recently re-calibrated our focus on the small business sector as well as broadened our scope of investment banking products and consulting services. As mentioned above, CFMC was founded in 1990 on Ken Gerhart's kitchen table with a legal pad, calculator and a dream. With two older kids, a curious toddler crawling under the home-office desk unplugging the land line in the middle of a business call and his younger brother on the way, CFMC was launched. Following these humble beginnings, we now have more than two decades of experience serving our clients with a hands-on approach. From an early stage business scrambling to have their first SBA loan funded, to a surging company seeking their fourth round of SBA funding, to a middle market acquisition where a forensic audit turned up inventory valuation irregularities, up to a $25 million factory expansion too busy to schedule a closing, we have seen virtually every scenario in middle market corporate finance. Whether you are a growing business seeking business intelligence (BQ), a new business seeking initial funding or an existing business seeking expansion capital, CFMC has the experience to turnkey your management solutions and financing needs. Experience makes a world of difference when lubricating the gears of BQ and corporate finance with effective strategic planning, so capitalize on our proven track record to obtain the management systems and/or funding with which to grow your business. Contact us today to get started!